Kevin Fritz and his family, need your help and prayers for their oldest son, Ashton Fritz (age 17). He was just wrapping up an incredible week at Hume Lake San Diego with their Bayside Church high school group, supposed to be headed home. Instead, he suffered an unfortunate accident injuring his back and spinal cord. He is in excellent hands at UCSD Med Center. Currently has no mobility in lower extremities and upper is affected to only slightly lesser degree. They will do surgery later today thru the front of his neck to fuse the bones, and probably another surgery in a few days, posterior fusion. His camp counselor James Rogers stayed with him thru the night as the Fritz family was in transit to be with their son and brother. Please pray for the best possible outcome and recovery. Ashton will be undergoing several surgeries as his doctors recommend through this journey. The Fritz family is looking into a special spinal cord injury program out of state, that can give Ashton a better chance of recovering use of his limbs. Your support at this juncture is critical. Thank you to those that have contributed, and please spread the word, we need to hit our goals. Thank you all. Well, it's been a year since the tragic accident of Ashton Fritz. The family is very grateful for all of your love, prayers, and support. 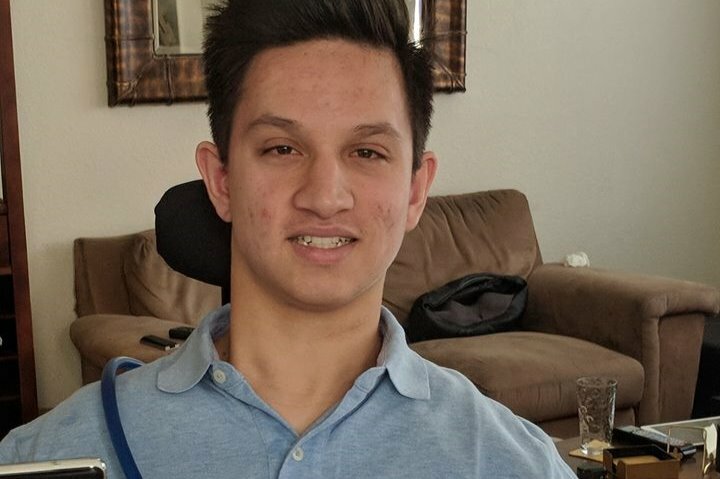 Now, Ashton is 18 and needs more support for on-going rehabilitation and equipment that he will need moving into adulthood. Let's get this account raising money again, and we still have tshirts so be sure to get one! Thank you all again for your continuing prayers and support. Join us for the Grand Opening of the New Quick Quack Car Wash next to Costco in Folsom. 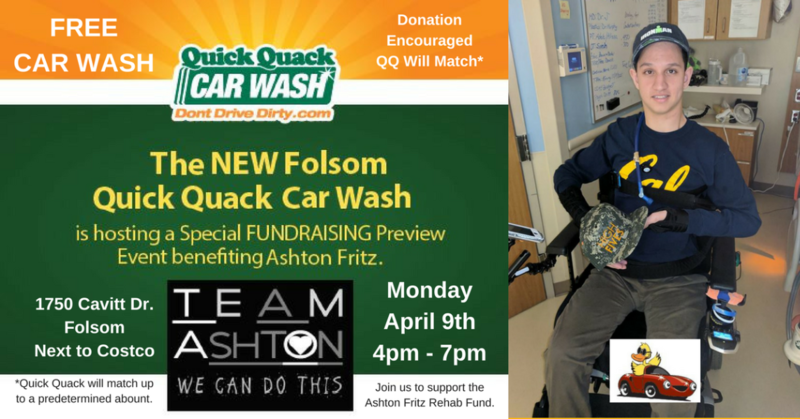 April 9th, 4-7pm you get a FREE Car Wash, Donate to the Ashton Fritz Rehab Fund and QQ will match your donation up to a predetermined amount. WE CAN DO THIS! Team Ashton! So Ashton has been home from Craig Hospital for two weeks. The first two days we had the comfort and help of Craig staff: Nurse Tonya and OT Amy. They were a huge help in getting us organized, mapping out routines, and adapting the house for Ashton. He visited Vista Thursday to meet his English teacher and map out the campus. Friends came by the house Friday Eve to welcome him back. Saturday night Ashton went to the Crosstown Cup at Vista. Friday, Monday, and Wednesday were medical appointments. And last Tuesday was a special night for the ever-supportive wrestling teams from both Folsom Middle and Vista Del Lago High. Folsom had a dual against Sutter Middle; Colton got to wrestle and the team all wore "Team Ashton" t-shirts. Then came Senior Night at Vista's last home dual. Ashton most likely would have wrestled Varsity this year, were it not for his injury over the summer. Vista gave him a special recognition -- we have been SO touched by all the love and support!! !